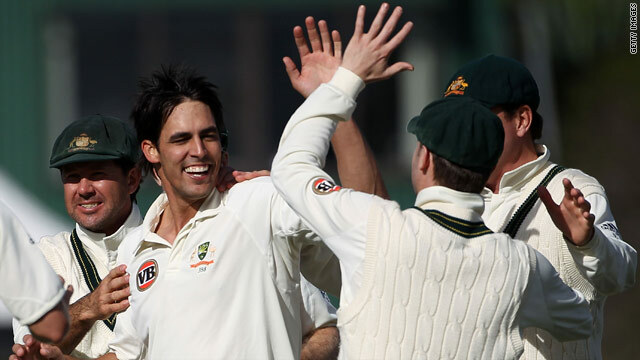 (CNN) -- Australia fast bowler Mitchell Johnson ended with figures of 6-73 as Australia beat New Zealand by 176 runs in the second Test in Hamilton to claim a 2-0 series win. New Zealand collapsed as Martin Guptill, Brent Arnell and Tim Southee were dismissed in successive overs, meaning the Kiwis could only reach a score of 302 in their second innings in response to Australia's total of 511. Brendan McCullum top scored for the hosts with 51 before his wicket fell to a Michael Hussey catch off the bowling of Doug Bollinger. Following the loss of McCullum, New Zealand could only add another 63 runs. Left-armer Johnson finished with match figures of 10-132, and claimed the wicket of Arnell for a duck to bring the match to a close shortly before lunch. Australia's recent form has included clean sweep victories over Pakistan and the West Indies and, after sealing the win against New Zealand, captain Ricky Ponting claimed his team are in good shape ahead of the forthcoming Ashes series against England. "There's a great confidence in the group," Ponting told reporters. "We can look forward to the Ashes knowing we've done most things as well as we can."